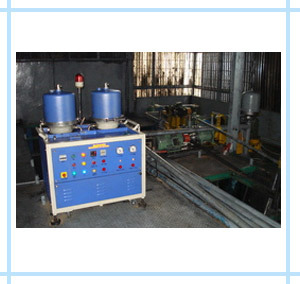 Centrifugal Oil Cleaning System is most effective system for cleaning Stamping Oil / Anti Rust Oil being used in Press Shops, Pipe Manufacturing Companies, Steel Wire Manufacturing companies etc. When components are deeped in Anti Rust Oil Tank, contaminants sticking to teh components gets mixed in antirust oil causing increase in contamination level. Beyond certain contamination level, entire oil needs replacement. By using Centrifugal Oil Cleaning System, oil gets cleaned resulting extended oil life.